Cynthia Kizza is a corporate attorney by profession, and a gourmet cook at heart. Together with marketing strategist and food photographer Daniel Akrofi, they run 'A Kitchen in Accra'. 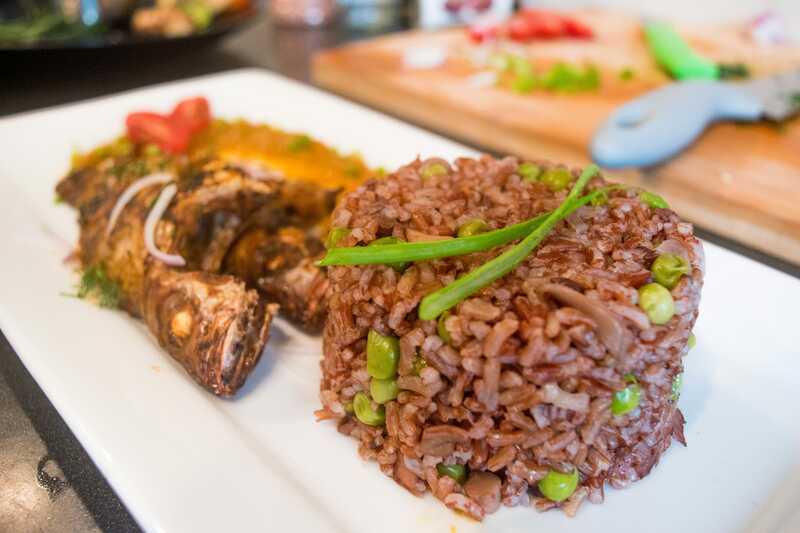 Local brown rice is mostly grown in the Volta region of Ghana. It is chockfull of vitamins, minerals, fibre and protein. When it comes to nutritional value, it is undoubtedly far superior to our much -loved white rice. Although referred to as “brown” rice, the rice has more of a reddish tint due to anthocyanins which are pigments that give red, purple and blue plants their rich colouring. Anthocyanins act as antioxidants and may offer anti- inflammatory, anti-viral and anti-cancer benefits. Brown rice has more fibre than white rice which means that if will keep you fuller for longer. The high fibre content means that your body digests it much slower than white rice, reducing the risk of diabetes associated with eating white rice often. If you are looking to manage your weight, brown rice may be of assistance. Add olive oil to a pot over medium heat. Add mushroom and cook until cooked and any liquid has evaporated. Stir in the rice, salt and vegetable stock. Bring up to the boil, lower the heat and cover the pot. Cook until rice is soft. Add peas and stir through the cooked rice. Cover the pot and allow the peas to cook. This should take about 5 minutes. Et Voila! Serve with choice of protein and spicy sauce. You can pair this with any sauce of your choice. Enjoy!